My first (and only) horse I got, was an arabian gelding. 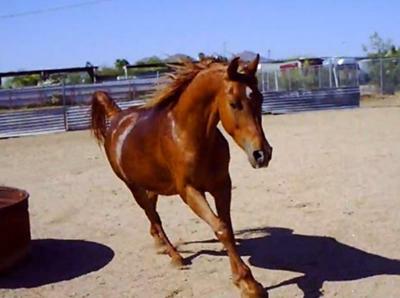 He's a gorgeous red dun color (A mixture of dun and chestnut, basically a chestnut horse with a dorsal stripe!) I worked hard for one year to train him all by myself. A mere kid. And I DID IT. I did what everyone thought was the impossible: for a young teen to train a 3 year old Arabian. He still has more training to accomplish and I'm still working on it! But now, he gives riding lessons! He's such a kind horse and I hate to go on vacation. I'm moving soon and my dad wanted this house in a HOA development (Home Owners Association) he doesn't have my horse, my mom does, because my parents are divorced. So I said "Dad. If we move, we're moving to a place we can take my horse, otherwise, I'm not moving. i want my horse with me all the time, not just at my mom's." And he sighed, a deep troubled sigh, and said "All right. I'll look over in the mountainous area, where most people own horses." I know he will find a home for both me and my horse, and I'm excited!